Building a boat takes commitment and heart, and sometimes the most difficult part is just starting the project from the beginning. 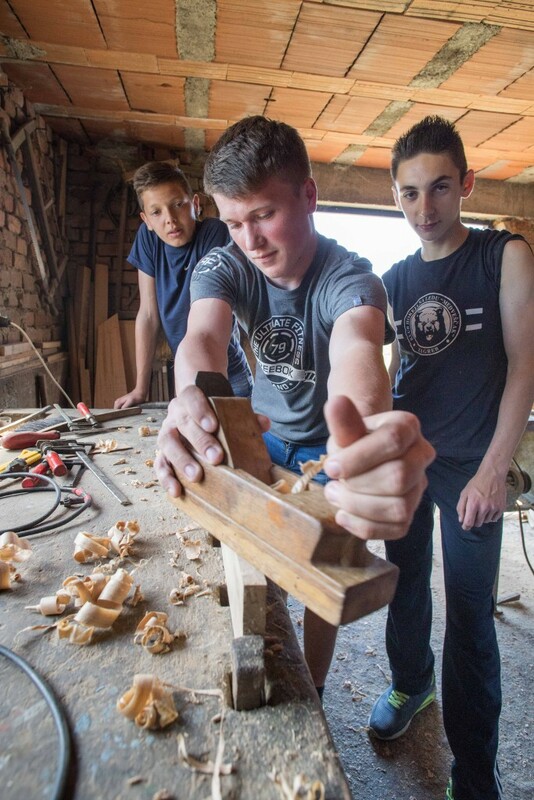 While building this 5.5 meter boat with the kids from the home for children Vrbina home for children in Sisak, Croatia none of these things were problem. The preparation came together like clockwork and the director of the home said that the students loved coming so much, they were constantly asking, “when can we go work on our boat.” New friends, new places, and excited individuals aligned to help the students learn this heritage trade of making riverboats and the hearts of all the participants were full each day as they saw the boat and go from a tree trunk to planks to form the shape of a traditional vessel. 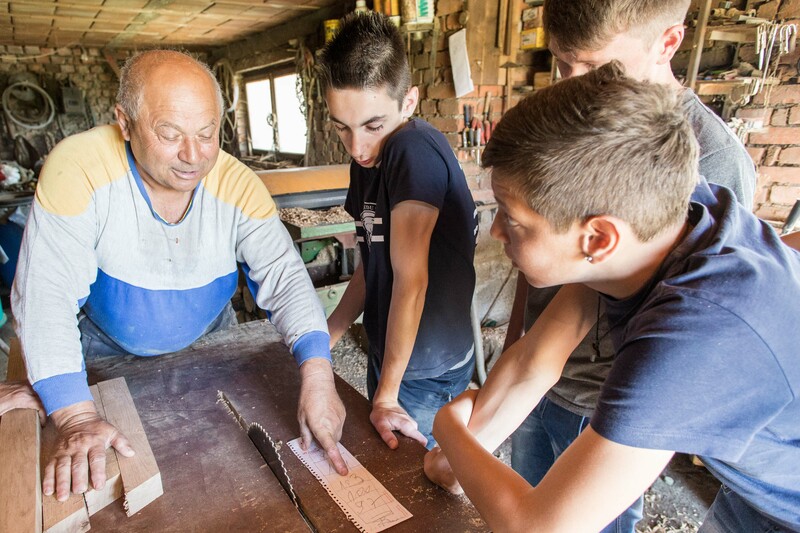 The way this program was designed pairs an elder builder with a group of students from the surrounding region. This enables the direct transference of knowledge from the builder, the holder of the heritage trade, the intangible craft, that has been passed down from generation to generation, to work directly with students so that they can learn to understand the why, how and what of each part of the vessel as it is built. Adriatic Maritime Institute itself is really just a facilitator in order to get these two groups of people together to perform the task that has been repeated so many times before. 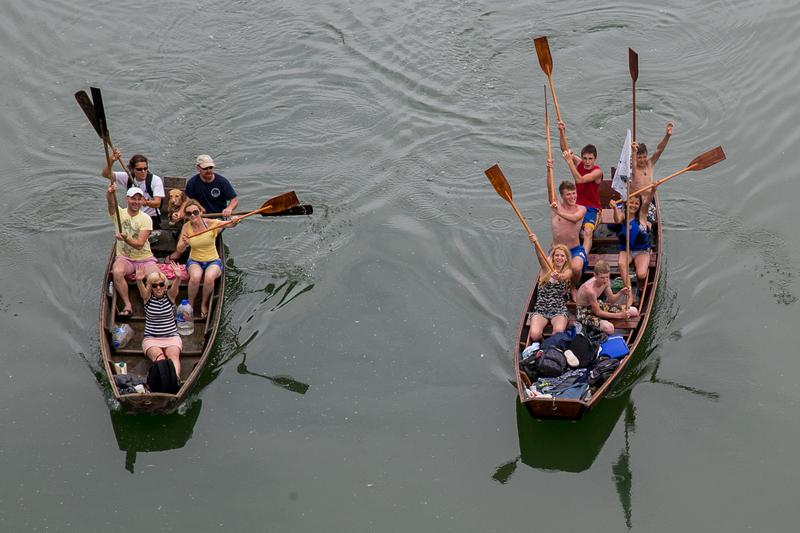 This was accomplished in such a way so that these students and this boat builder could go from learning about each other, to learning about the boat, and then learning about the river. While most people just order a new boat and arrive the day it is ready, we wanted to see each step of the process as it was built. This is kind of like going to a restaurant and asking to help the cook while they prepare the meal. We hoped that they would enjoy the process. This was evident when it came time to pick a name for the boat. The could have named it anything, a cartoon character or something silly, but instead they chose to name the boat to honor the builder that they had spent so much time in the past few days, Stjepan. As he was honored he also grew through working with the students. The boat was made from oak, with fore and aft transoms placed on a flat bottom with lots of rocker to help the vessel maneuver in the sometimes swift water of the rivers that flow through the region. Similar to a scow type, the forward transom allows for greater volume and the boat can easily carry seven or eight people. During building, the frames are placed on the bottom, which is cut to shape. Then the boat is turned upside down and side planking forms the curve, as the bottom is pushed on with the help of a car jack, slowly nailing at each offset. The overhanging planks are attached to the transoms and trimmed. The boat is then flipped again, then rails and seats are placed on the inside. The wood is treated with bitumen tar and each of the seams receive a wide strip of tin flashing to reduce leaking as the boat is pulled in and out of the water. Many of the students had never even been on a boat of any type. On the first day they came to see the boat and went on the river. You could see in their faces the fear and excitement as they got into the boat for the first time, wearing unwieldy lifejackets and trying to learn how to hold a paddle became contented excitement and exaggerated enthusiasm as they climbed in and out from the muddy bank. The second time they visited the boat builder they learned about each of the tools in the workshop and the safety and the skills required to use them. The students would start with simple lessons like how to hold the hammer, how to bend the arm from the elbow and not the wrist, how to use the saw and how and to cut, and grind, and use sand paper. The third day, they prepared the wood from the raw planks. They put tar on the outside giving it its black color and preserving it for the future in the river. The fourth day they started to put the bottom together. For the first time the students saw the shape in the cut piece on the floor of the workshop. When they put them all together; stem and stern, bow and transom, the shape of the curves of the 5.5 m flat bottom Riverboat emerged with the ribs holding the shape much as our own ribs hold in our body. 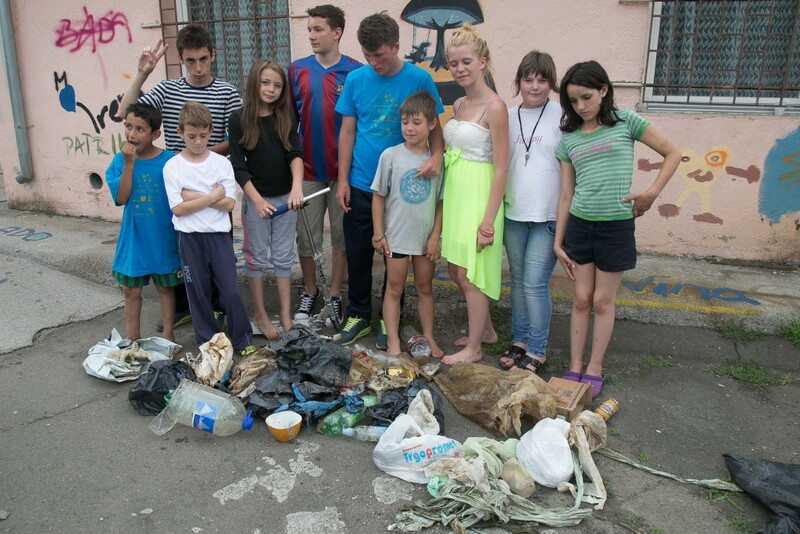 After this day, the students were more and more excited to come back to finish the project. The first three days were spent the making the shape of the hull and the last two were spent with the details, plugging holes, making trim, and putting the finishing touches on the boat. After five days the boat was complete the paddles were made and each of the parts of the process had been under been understood and completed by the students. The middle of the program was marked by the launch, which was followed followed by a camping trip and expedition down the river back to their home. 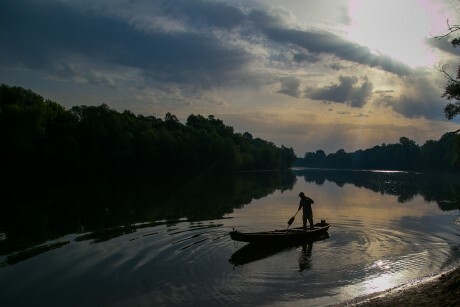 As the boat slipped into the river, thoughts difficulties at home and in life, sliped away as the dense oak boards danced on the waters surface. Kids of all ages, students from the home, and the community rejoiced in the completion of the first part of the project. Jumping around, swimming together, and filling the boat with water several times, it was clear that the new build was successful in its mission to bring people together. Many students learned how to paddle and work together to keep the boat on a strait course. There were several levels of emotion that were felt during the launch, and as the friends and family went away the boys and girls completed the transition from wood to boat and back to wood when they plant three oak trees. The process of the building is transformative, in many ways. Transforming wood from the living tree into planks, and then the shape, its design from the elements of nature, to existing to be part of nature again. The tree lives twice, once in the forest and then once on the water. As part of this transformation, the students planted three oak seedlings during the launching ceremony. As they put the seedlings down in the soil, they said a few words to help oaks grow and to begin again the circle that would be completed maybe one day in the future, when young boat builders such as themselves would use the wood again to build a boat. It is this transformation, seen though these heritage arts, that allows knowledge to be passed down and understood. After the party was over, they prepared for their first expedition with a new vessel that will take them home. Gear was loaded into the boat and lack of noise was quite clear as the paddles sliped in and out of the water. Subtle smiles as a sign of contentedness alighted the faces of the young boys and girls on the trip. 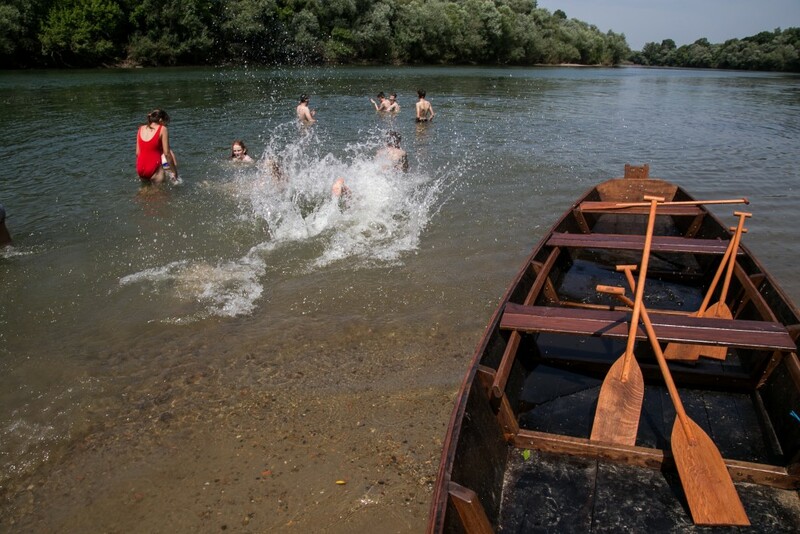 By the end of the expedition, they not only had helped to keep a heritage craft alive, but had also found excitement of exploring the river that flows through their town. Along the way students collected trash, some of which was high up in the trees after the spring floods. The boat had provided a method to not only regain confidence, but also connection with the natural world around them. The trip was long and energy was up and down, as they realized the duration of the first days paddle. When they passed the under the historic bridge in their hometown a crowd gathered on the shore. Their spirits were lifted once again, as they brought the boat to their home. When they arrived, a crowd cheered on the beach and they were greeted as heroes. When they stepped ashore, they were renewed. They were not the same students that we first met at the beginning of the story, but now the story is theirs. They have become transformed though the process; building trust, building boats, building community. Thier story focuses on the heritage trade of boatbuilding that was passed from generation to generation then to them. Meeting the expert builder, who learned the trade from his father before him, students were surprised and excited to find they can build a boat. From the first time in the boat, to the arrival at the final destination, the river is a metaphor for transformation. The tree lived as a majestic oak and now lives on as a vessel for intangible heritage. The builder changed by sharing his craft and the students were also changed through gaining experience with simple tasks as the boat was built. Each part created a triumph that they saw as a success, and the combined product was a boat that will now reside at the Vrbina Home for Children. This essentially is the beginning of the story. Now, the students will start to prepare for their first rowing race in August one of many races and expeditions for years to come. The story, like the river flows in one direction growing, adding new parts, and overcoming obstacles along the way.